Doing craft projects with your kids is a great way to bond. Crafting teaches kids to be creative and explore new things, giving them self-confidence that will be useful well beyond the craft table. 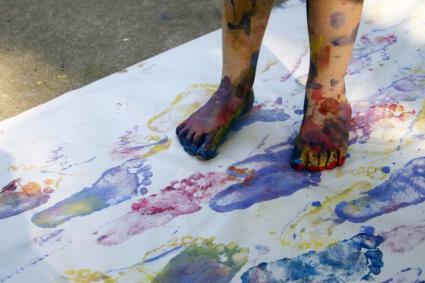 Family craft time allows you to talk to your kids in a non-judgmental setting while you're working on a fun activity. Preschool-age children can use safety scissors, so think about projects that involve both drawing and simple cutting, like tracing their hands and cutting them out to make a wreath of hands. In wreath projects, you child can decorate each hand separately and then glue or tape them together. Kids can cut out and decorate other simple designs like hearts and stars for holidays. Look into Kids Paper Crafts for more projects you can do with preschool-age kids. Sticker projects are also a fun activity for young children. Kids can use stickers, which come in just about any design you could want, to decorate things like a special sign for their bedroom door, a picture frame, or a holiday card for Grandma. Kids of this age love music, so help them make simple musical instruments, such as the famous shoe box guitar. You can make a shoe box guitar by stretching rubber bands around an open box. Create a shaker made out of a paper towel roll filled with beans. Put wax paper on the ends, secure it with rubber bands, and let the child decorate it and play it, too. These easy instruments can help you and your kids create family music night. Kids can string simple jewelry. They'll be able to give their creations as gifts or show off their handiwork at school. They can also decorate a T-shirt or use paint pens and glitter to make a special candle holder. Older kids can start doing cross stitch with special kits designed for kids that use plastic needles and have big squares. It's great to teach late elementary-age kids how to knit or crochet, since these crafts don't use sharp instruments. With supervision, kids this age can also start using the sewing machine for simple straight sewing. One great beginner project is making bean bags to use in fun games. Simply cut two squares out of cotton fabric, have the child sew around three of the sides, add beans, and close up the open end. If you are there to guide them, kids can start making candles and soap (especially melt and pour soap). Older kids can try more difficult patterns of cross stitch, and they can start using sharper needles (with a warning that they really can make you bleed). Your kids might enjoy learning to make a simple origami animal to decorate a package or give to a friend. Kids of this age might want to start sewing clothes, and they can make more complicated knitted or crocheted items. This age group also probably has the patience for simple beaded jewelry, and might be interested in starting scrapbooks to remember their school days. The important thing when planning crafts for older kids is to really pay attention to what they want to do. It's great to encourage kids to try new things, but you don't want to make it torturous. Just because knitting is your favorite pastime, doesn't mean your child will love it. Give them time to explore what kinds of crafts they would like to do. You may find that you have a budding painter on your hands when you really wanted him to love decoupage. We can't make our kids like what we want them to like. The important thing is to keep a lot of options open and continue to try new things. Be enthusiastic about crafting with your kids and let them try things they express interest in. It may just be that crafting is the only thing you have in common as your child turns into a teenager, and you'll want that common ground to fall back on. Crafting is great because it gives kids a creative outlet, allowing them to learn about trying new things and making mistakes in a low-pressure environment. Depending on the craft, it can help kids with math, and almost all crafts help with following directions and logical order. Crafts can help with spatial development and a child's sense of color. They give kids the confidence to start a project and see it through to the end. Crafting can teach kids to be generous, especially when crafts are made to be given as gifts or donated to those less fortunate. Crafting also provides a way for two (or more) generations to work together, providing memories that will last two lifetimes.